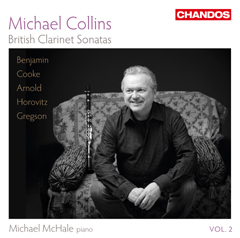 Chandos have released a new CD celebrating British clarinet works by Cooke, Horovitz and Gregson performed by one of the leading clarinettists of today, Michael Collins. The CD includes Tributes by Gregson which is formed of five pieces each dedicated to a composer and a clarinettist. Having had long associations with Collins, Gregson dedicates the fifth piece to him and the clarinettist gave the world premiere performance of Tributes in 2010. For more information including purchase details please visit the Chandos website.